Caran d'Ache Madison ballpoint pen. German Silver in a five lined pattern. Excellent + condition. Product Name Madison. It looks similar to the current Geneve pens in clip style but not in width or cap derby. Manufacturer and Year Caran d'Ache, Swiss Made -- this is a current model but this looks quite different from the new ones. We do not know when it was made. Length Just over 5-1/4". This is a very slender pen. Filling System Takes Caran d'Ache refills, and can also fit Parker style refills. The mechanism works by twisting the cap derby clock and counterclockwise. A blue Caran d'Ache refill is installed. It has some ink left. Color Silver with a five line pattern separated by a solid silver section. Silver trim. We know that some of these silver-looking pens were made of Alpaca, aka German Silver which is an alloy of nickel and silver. Condition Excellent + condition. No dents, dings or personalization. This is a slim, elegant ballpoint pen. 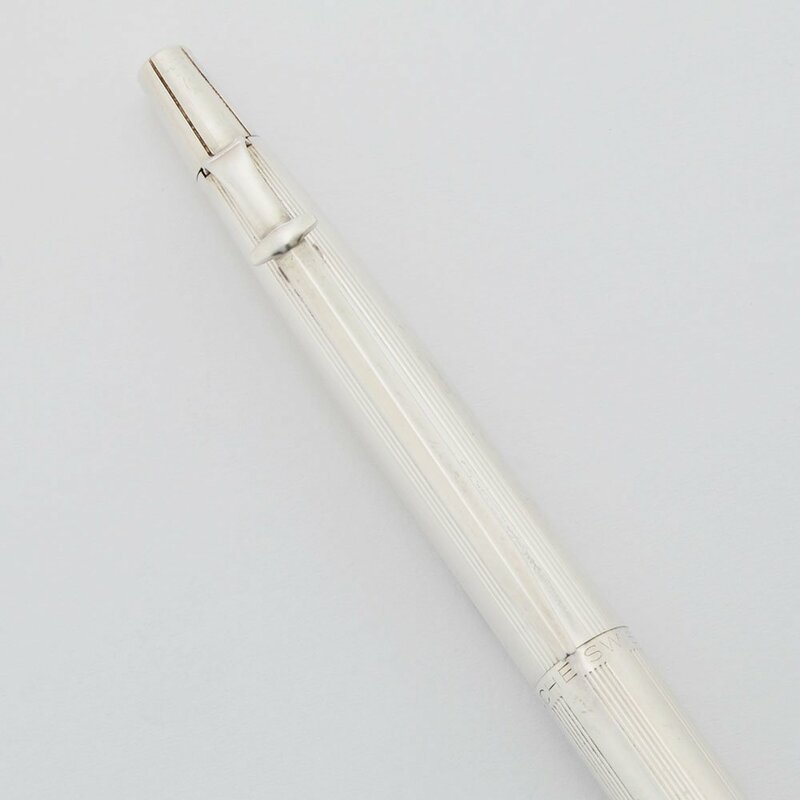 The pen has light signs of usage throughout. There are some small black marks near the nose cone, some kind of tarnish.